Kenya Tanzania combined migration safaris, Kenya Tanzania wildlife safaris, Masai Mara Lodge tours, Masai Mara and conservation area Great wildlife migration safari holiday. In Tanzania. In Lake Manyara lions have developed a liking for residing in the branches of trees, and Ngorongoro Crater is said to have the world’s densest population of lion. Located high on the slopes of the Oloolaimutia Hills, Masai Mara Sopa Lodge was one of the first safari lodges to be built in the Masai Mara Game Reserve, a reason why its gardens and trees are so lush and mature. All the buildings follow the design of traditional African round houses with conical roofs, and these stretch along the line of the hills with the impressively large public area buildings and the swimming pool at their centre. The Maasai Mara Game Reserve is arguably Kenya's most popular game sanctuary. It is the most famous and most visited game reserve in Kenya. The film 'Out of Africa' was made to a great extent in this reserve. Virtually every type of wildlife can be seen at the Mara. A spectacle worth seeing is the annual migration of millions of wildebeest, zebra and gazelle from Serengeti plains across the Tanzania border and the Mara River to reach Maasai Mara grazing fields from late June. The dramatic crossing of the river and the preying on the migrants by predators can be viewed from early July to August. The reserve abounds with birdlife since dose to about 452 species have been recorded. Hot air balloon safaris are readily available in this park. Early breakfast at your camp, after breakfast, Leave Mara for Nakuru arriving in time for lunch and check in at Lake Nakuru Lodge, have lunch and relax. Later afternoon game drive to see one of the largest ornithological spots, Flamingo, and a variety of wildlife not forgetting the famous white Rhino and black rhino found in this park. Dinner and overnight at. Flamingo hill camp. Amboseli National park is one of the most popular wildlife sanctuaries in Kenya. The Park lies at the foot of Mt. Kilimanjaro, the highest mountain in Africa (5,896m) whose snow-capped summit presents a splendid view on clear days. Amboseli National Park is often referred to as "The home of Elephants' some of the largest Elephant herds are found here. The Game Park also contains vast groups of Zebras, Wildebeests, Giraffes, Buffalos, Hippos and Antelopes. Also to be found in Amboseli are lions, leopards, Cheetahs, Rhinos and many species of plain game..
Pre - morning game drive, after breakfast proceed for another game drive before you break for lunch. After lunch, another evening game drives. Meals and overnight at asopalodges. 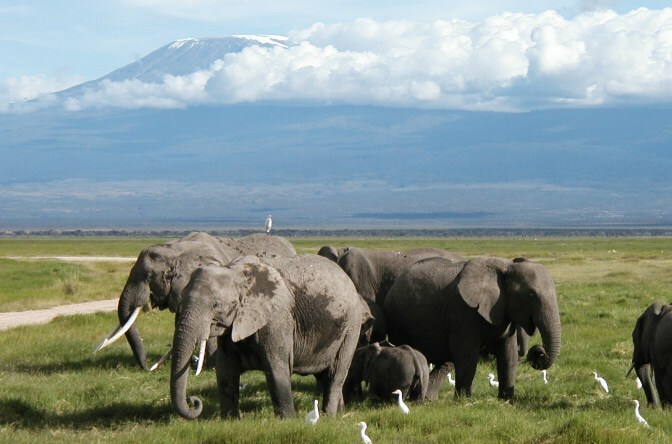 Amboseli National park is one of the most popular wildlife sanctuaries in Kenya. It is situated close to Kenya. It is situated close to Kenya- Tanzania border, The Park lies at the foot of Mt. Kilimanjaro, the highest mountain in Africa (5,896m) whose snow-capped summit presents a splendid view on clear days. Amboseli National Park is often referred to as "The home of Elephants' some of the largest Elephant herds are found here. The Game Park also contains vast groups of Zebras, Wildebeests, Giraffes, Buffalos, Hippos and Antelopes. Also to be found in Amboseli are lions, leopards, Cheetahs, Rhinos and many species of plain game. Early morning breakfast game en-route drive out of Amboseli and head to Namanga border arrives around 10:30aam cross to Tanzania after Visa clearance then proceed to Lake Manyara Lunch at Arusha Impala lodge, arrive with short game drive overnight at Serena Lake Manyara. Early morning breakfast then proceed to Ngoro Ngoro crater full day with packed lunch. Later dinner and overnight at Ngoro Ngoro sopa lodge. 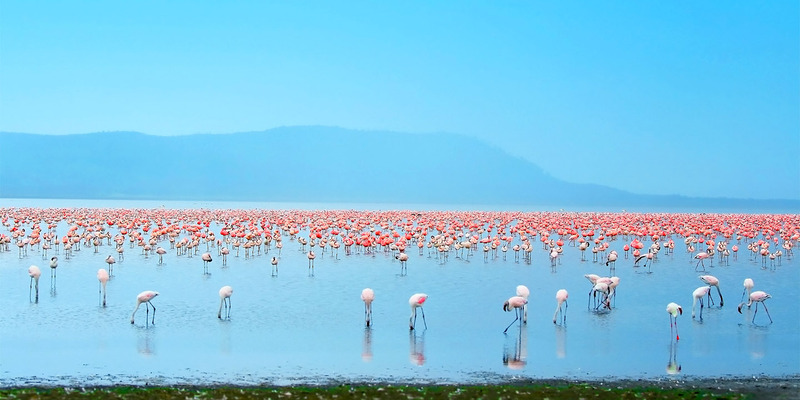 The Ngorongoro Crater is often called ‘Africa’s Eden’ and the ‘8th Natural Wonder of the World, a visit to the crater is a main draw card for tourists coming to Tanzania and a definite world-class attraction. The Ngorongoro Conservation Area (NCA) is home of Ngorongoro Crater. It was formed some 2.5 million years ago from a volcanic mountain sinking due to inactivity, and was initially thought to be higher than Tanzania’s famous Kilimanjaro. Early morning breakfast, after breakfast proceed to Serengeti you arrive with short game drive to Sopa lodge check in have lunch, relax later afternoon game drive and back for dinner and overnight at sopa lodges. Serengeti is Africa’s most famous and Tanzania’s largest park covering 14,736 sq km and is adjoining with the Masai Mara National reserve in Kenya. Early morning breakfast, then after breakfast proceed to Arusha, you arrive around lunch time we drop you to Arusha Airport you proceed to Zanzibar or you proceed to Mt Kilimajaro for climbing end of you safari.